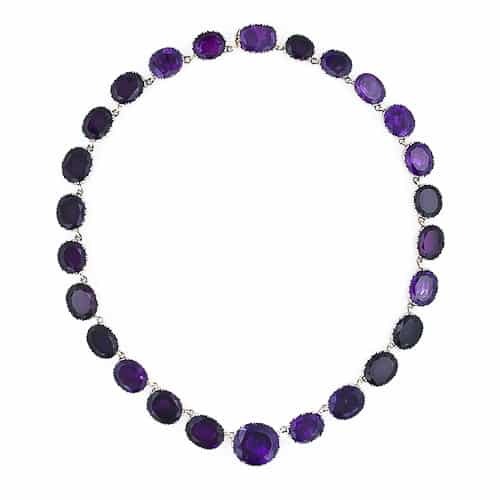 A rivière is a necklace that is comprised of gemstones of the same species that are all the same size and shape or graduate smoothly in size. Historically, the gemstones were set in separate collets and later in prong or claw mountings (much like modern tennis bracelets.) Rivières are usually designed without any ornamentation allowing the gemstones to be featured. Some rivières conceal a small hinged loop or loops that allow for the suspension of a pendant(s). Popular since the mid-eighteenth century, early designs were comprised of collets bound together by cord or ribbon while contemporary rivières are linked together. The popularity of the rivière created an everlasting classic that continues to adorn twenty-first-century décolletage.